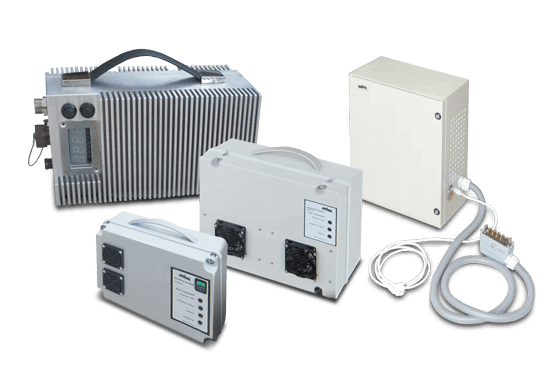 MGM COMPRO solutions include a wide range of charging systems, from the smallest with a few cells, to larger, high performance charging systems. Their advanced algorithms for charging and for cell management are exceptional. Protection, diagnostics, a wide range of options for PC communications and real-time monitoring of the charging process are all standard features of our chargers. The full range of MGM COMPRO charges includes non-balancing as well as balancing variants, covering the battery packs including standard balancing BMS systems, and also battery packs including special “airborne BMS” types. In such a case these chargers contain complete power sections along with a balancing modules (weight of balancing modules and charging waste heat stays in a charger instead of inside the battery pack). They all guarantee excellent charging, management and protection of all cells in the charged batteries. The portfolio includes systems with charging power of hundreds of watts up to those with up to 100kW and even more if required. As first on the market we introduced (AERO 2018) the possibility to fast charge serial electric aircraft with the same charger like your electric car. On demand, MGM COMPRO charging systems may include the requested automotive charging communication standards. We understand your needs. They are as unique and individual as your project. That’s why our charging systems are designed to allow their configuration to be as flexible as possible (numbers of cells, charging currents, charging performance, etc. ).